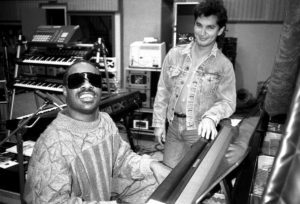 Stevie Wonder and Gary Adante. Photo by David Goggin. I first met Gary Adante in the 70s when I was managing Lyon Recording in Newport Beach. He and Stevie Wonder were recording “The Secret Life of Plants” and it was intriguing to see them working together, at all times of night and day. Gary first met Stevie as an assistant engineer at The Record Plant on Third Street in LA in 1972. Gary: I was a Record Plant assistant and one of my first session assignments was to set up the horn section microphones for “Superstition”. I had been working for Record Plant as assistant to Bob Margouleff and Malcolm Cecil for a long time and got assigned to Stevie’s sessions originally as a substitute for the engineer that had been their regular assistant, Austin Godsey, who decided not to do that session. The hours were really long and sometimes it was two twelve-hour sessions back to back with different artists and it just got to him and he wanted to move on. Because I had experience working with them for a while, I got assigned to them permanently. I had a good relationship with Stevie and I knew how Bob and Malcolm worked so I was just there. Stevie moved quickly sometimes and didn’t really have an agenda. He went from writing songs to overdubbing and it would switch on a dime. Bonzai: Let’s go back to the formative years between you and Stevie and Record Plant. I’d like to hear your imagery of the first time you walked in and how you ended up as a gofer or an assistant. How did you first contact and get into the Record Plant? Bonzai: How old were you? Gary: Nineteen, it was 1972. Obviously, Lee told them who I was and what I was doing there and I just sat there and came every day and read Billboard and Cashbox until they started sending me out on errands. I did a lot of running around for them, unpaid for a few months, until they hired me as a janitor and then from janitor to gofer. Bonzai: Did you have any personal contact with Gary Kellgren? Gary: Yes, all the time. I assisted him several times. Gary, to me, was very intimidating. He was a handsome guy and he dressed very appropriately for the times. He was very much of a white gloves engineer. Bonzai: White gloves? What’s that mean? Gary: He wasn’t the kind of guy who would go out and adjust his own microphones, or stick his head inside a bass drum or things like that. He relied on the assistants to do a lot, because he had already done so much of that in his career. It was understandable. He was the boss and he acted like it. Later on, especially when I would go up to Sausalito with Stevie, and when I was no longer a Record Plant employee, our relationship completely changed. He was so much more open and happy and friendly and it was more of a pure friendship than the “janitor makes good” kind of thing. Bonzai: When did you leave Record Plant? Gary: I don’t remember the exact date. Stevie offered me the job as his engineer when he and Bob and Malcolm split up. Bonzai: What was your first album with Steve? Gary: “Songs in the Key of Life”. Some of it was at Record Plant, but most of it was recorded at Crystal. Bonzai: Why did Bob and Malcolm separate from Steve? Gary: Well, I’ve heard a lot of stories about that over the years, but Stevie and I remember it the same way. After “Innervisions” became so popular and after they did “Fulfillingness’ First Finale”, Bob and Malcolm told Steve that they were so responsible for his success that he should give them more credit and points, and Stevie wouldn’t do that. That may have been because of his Motown upbringing. For whatever reason, he just drew the line in the sand and they kind of said, “Well if you don’t give us points, we’re not going to do an album.” Steve being a Taurus bull and stubborn said, “Fine. I’m the guy with the talent and know how to write songs and play music. I can get somebody else to work with me,” and he did. Bonzai: Can you tell me about the infamous Sunday night jam sessions called “The Jim Keltner Fan Club Hour”. Gary: There were no senior Record Plant engineers on those nights. It was me and Austin Godsey and maybe one other assistant and it was in Studio C. I think Paul McCartney was playing drums and John Lennon was on acoustic and there were two bass players and Linda McCartney was on some sort of keyboard organ and Ringo was doing something and it was pretty crazy. I drove over and picked him up and took him in and walked him into the recording room and put him in front of a Fender Rhodes and he was there for awhile and played, but no one could come up with a song that everyone knew. In fact, you could hear John Lennon screaming, “Does anyone know a song?” Basically, they just did three chord blues jamming for hours, but Stevie wasn’t there for very long. After about a half an hour, forty-five minutes of it I heard him screaming, “Gary, Gary can you come and get me? Get me out of here.” I ran in and got him and asked him what the problem was. He said, “This is terrible. No one’s playing a song. I’ve got to get out of here.” I went in and rescued him and took him back home. He would rather have not been involved in that kind of scene, but it is fairly historic looking back at it. Bonzai: Well, there is one recording. “Too Many Cooks”. Were you involved? Gary: I was there setting up, yes. If you were a low man on the totem pole you got stuck on that because it was on a Sunday and it wasn’t a paying session and it went on all night. Out of all those nights, there was just that one song that came out of it that I know of. I just remember Jagger coming up with a little hook and the lyrics and it was pretty much spontaneous. Bonzai: Before you hooked up with Steve as his engineer, what other projects did you work on that were memorable at Record Plant? Gary: Well, I had mixed some of Billy Preston’s album “The Kids And Me” and I actually took over after Lee Kiefer had started it. I was Lee’s assistant and he asked me to finish it. I mixed Billy’s single “Nothing From Nothing”. Gary: It became a really big single. The group Rufus had the same management. Because that single was so successful, I went on to do the next Rufus album as well and worked with them a little bit after that. It all happened when Bob and Malcolm and Stevie were breaking up. I remember riding in Stevie’s car on Sunset Boulevard and “Nothing From Nothing” came on the radio and I told Steve, “You know I mixed this song,” and Steve went crazy happy. It was such a big single and so successful and it sort of cemented my work in his mind. Bonzai: Well, you got a reputation. Tell me about Chris Stone? Did you have much involvement with him? Gary: Well Chris was like the day-to-day man. Not a studio manager, but he did all the operations. I saw him every day. He was like the main boss. Gary was there a lot, but Chris was more like a nine to five. Bonzai: Did you like Chris? Gary: Yeah, I did. Again, after I stopped becoming employed by Record Plant, we had more of a friendship. Bonzai: So you transitioned out of being an employee and solely working with Steve or were you independent working with other artists after that? Gary: I was on the payroll with Steve, but he would go on tour or have lapses in his recording schedule where I could work with other artists and I did as much as I could schedule, but I was mostly working for Steve. I remember later working in the Record Plant remote truck outside Steve’s Wonderland studio. We rented it for years and years and Stevie could’ve bought the truck several times over in the time we paid to rent it. The schedule just varied day-to-day. Sometimes we would have contests to see who would have the record for consecutive hours worked, because we would do one twelve hour session and have to do another one back to back. Gary: No, I would work, for instance, all night with Stevie and then have to do another session with another artist all day and then have to try to do that as many times as was required. Bonzai: How did you do it? Was it a lot of coffee? Gary: No, I didn’t even drink coffee most days. I think for me it was just when you’re young you can do a lot of things that you don’t think you can, and can’t do for very long after that. Bonzai: Okay, one more question, because every time this subject comes up people remember it differently. Were you around when Phil Spector was working with John Lennon at Record Plant? Gary: Yes, and he fired the gun off in the canteen. Bonzai: Okay, tell me about that. Gary: Actually, Stevie remembers it as well. I think Phil was having an argument with Mal Evans who was actually the boyfriend of the studio manager at the time. I don’t know if he fired it at him or whatever, but Stevie remembers hearing the gunshot in the canteen. Gary: Yes, I was there, but I didn’t hear it. Bonzai: Okay. There are different stories. Evidently May Pang was there and Mal Evans was trying to pry the bullet out of the wall. Gary: That’s right. May used to sit up front in the reception while all the sessions were going on and just hang out and talk to whoever was at the desk all night and so she would’ve been there. Bonzai: Did you meet John while you were at Record Plant? Gary: Yes, I assisted on some of those sessions he was producing with Harry Nilsson. Gary: Yes, and I actually introduced Stevie to John. I walked him into the control room that John was working in with Harry and everybody turned around for some reason. When you have a spotlight on you, it’s one of those kinds of things, one of those moments when the music stops. John recognized that I was with Stevie and he must’ve been not himself because he got up and planted a kiss squarely on Stevie’s lips and Stevie grabbed my arm like what’s going on. They talked for a while and then I escorted Stevie out.